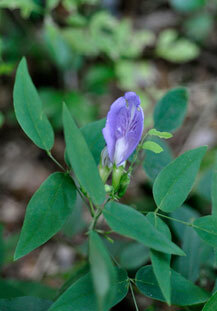 Stems: Vine, slender, nearly erect to trailing or twining, 8-16(-36) inches, glabrous to sparsely pubescent. Leaves: Alternate, pinnately trifoliate, 2 to 4 inches; stipules subulate, .7 to .4 inch; petioles 1 to 2.8 inches; leaflets entire, ovate to lanceolate, .4 to 2.8 inches long, broadest at base, glabrous or sparsely pubescent below, apex tapering to point. Inflorescences: 1-3 flowers in axils of leaves; peduncles .1 to 1.6 inches long. Flowers: Pedicels .08 to .3 inch; calyx tube cylindric, flaring, .4 to .6 inch long, usually glabrous, teeth 5; corolla papilionaceous, pale blue or lavender with purplish veins; banner 1.6 to 2.4 inches long, 1.2 to 1.6 inches wide, much exceeding keel and wing petals; keel strongly incurved, shorter than wings and coherent with them to middle; stamens 10, diadelphous (9 together and 1 free). Fruits: Pods, oblong-linear, 1.2 to 2.4 inches long, flattened; seeds brown, ca. .16 inch, sticky, smooth, shiny. Habitat: Lowland or upland rocky open woods and thickets, stream banks, wooded hillsides, ravines; prefers dry acidic soils. Uses: The Cherokee held an infusion in the mouth to treat thrush. Comments: Late season flowers are often cleistogamous.